I have been playing the piano since I was about seven years old, and since I was in junior high, I have also owned an electronic keyboard. Keyboards were big-ticket items when I was a kid because they not only cost a decent amount of money, but also were pretty amazing. The better keyboards could synthesize a ton of instruments and had several present rhythms and one-touch chords. 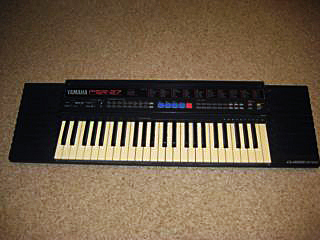 My first keyboard was a small Casio PT-180, which I remember bringing into school to work on a project, but the first keyboard that I remember really being important to me was myu second one, a Yamaha PSR-27. In terms of keyboardness, it wasn’t much (compared to some of the more high end models), but it had way more instruments than that Casio, plus came with its own stand so instead of taking it out of the box, setting it up, and plugging it in whenever I wanted to use it, I simply set it up and plugged it in in the basement. The coolest thing on the keyboard was a yellow button that said “demo.” This was pretty much exactly what you’d think it was–a demonstration of what the keyboard was capable of, done through a 90-second song that used several instruments, rhythms, and effects, including the orchestra hit, which was popular to almost an annoying degree in the late 1980s and early 1990s. My sister and I played that keyboard endlessly, fooling around with the different instruments, playing our weekly piano pieces on the “distortion guitar” or “church organ” settings, and even adding the one-touch chords and disco beat to songs like the Star Wars theme. But the most fun we had was with the demonstration because it was a crazy tune that used just about everything the keyboard offered and even if we figured out how to play it, we would never be that good because we were not very quick at changing instruments. But more importantly, this was around the time when the two fo us were really into playing with her stuffed animals. Yes, I know that it seems weird that a twelve year old would play with stuffed animals, but Nancy was still nine and there were many days when the two fo us were stuck in the house together. By this time, stuffed animal play had evolved to the action-adventure stage. Each animal that was among our “main players” had a distinct character and we were even working on a semblance of continuity when it came to our stories. That is, of course, when we weren’t playing Battle of the Stuffed Animal Bands. This was a regular contest that featured four of the most hard-rocking groups of animals: two frogs named Felix and Fred, otherwise known as “Fe and Fred;” the guitar-laden novelty animal Rockasaurus; the beaver-rabbit-raccoon combo known as the Woodland Creatures; and two dogs that we called the Nas. Pronounced “Nyeahs,” the Nas were Frankie and Rover, two small dogs that were about the size of baby Pound Puppies but were actually a Pound Puppies knock-off called Happy Puppies. We had each received a Happy Puppy for our birthdays from my grandmother–Frankie was mine and Rover was hers–and over the years, they had taken their fair share of abuse. Paws had been stained, seams ripped and then sewn back together by my mother, and Frankie was missing an eye. Despite all of this, they were the two animals we played with the most and were the best band in the battle. The Battle of the Stuffed Animal Bands tended to always go the same way. The stage would be my dad’s workout bench, and Rockasaurus would open, performing an original tune that basically went “Rock, rock, Rockasaurus.” Fe and Fred would follow and their performance would be the two of us playing a song on the radio (usually something by Weird Al) and making them sway back and forth and jump around, which looked hilarious at the time. At twelve and nine years old, we weren’t exactly masterful lyricists, although I have to say that having them say “shuuuuuut up, we rule” when there’s that sweeping effect was quite epic. But the Woodland Creatures’ performance was enough to put them ahead and the crowd would go wild. Then, the Woodland Creatures would show their true colors because when the Nas took the stage to sing the Troggs’ “Wild Thing,” Chuckie pulled the plug. With no working instruments and no mic, they’d seem completely screwed. But Rover apparently had a voice powerful enough to be heard through a full arena without a microphone and he managed to sing the entire performance a cappella and without equipment, trumphing over the shifty varmints. … well, it’s nice to be reminded how fun it was to be twelve. Thank you so much! That was a good memory of air playing along to that! We would play that all the time! My brother and I just devoted to search for that and surprised him that o found it!